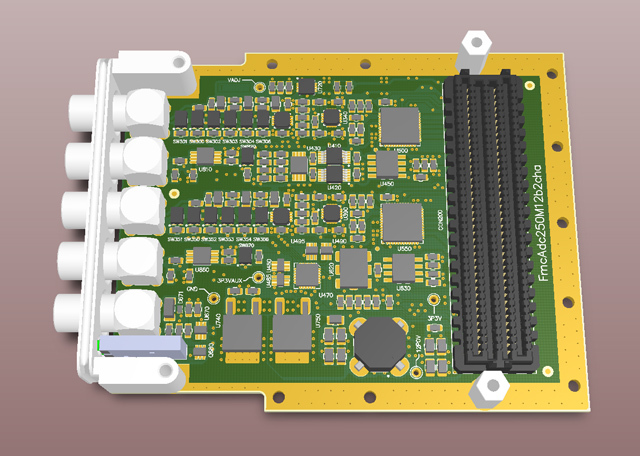 The FmcAdc250M12b2cha is a 2 channel 250MSPS 12 bit ADC card in FMC (FPGA Mezzanine Card) format using an LPC connector. The gain can be set by software in three steps: /-50mV,/-0.5V, /-5V. An advanced offset circuit is used in the front-end design of the ADC board, and allows a voltage shift in the range of/- 5V that is independent on the chosen gain range. To see how this mezzanine can be combined with a carrier and turned into a complete system is TBD (information follows as soon as possible). 09-01-2012 Start working on project. 18-01-2012 Functional specification defined, first release of electrical block diagram made. 08-02-2012 First release of electrical schematic diagram ready for review. 15-02-2012 Simulated three slightly different approaches for the analog input stages. 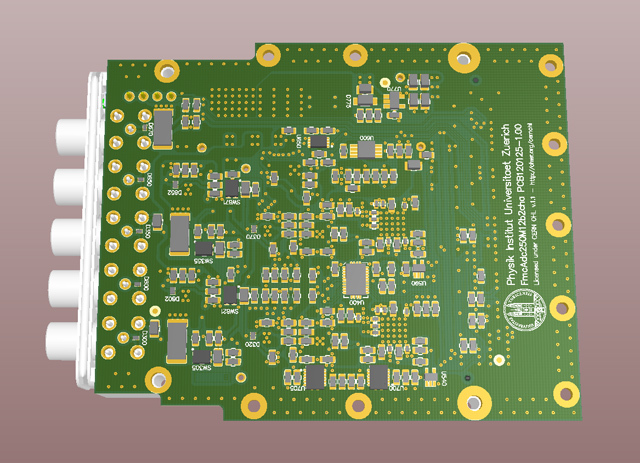 Optimizing SAR ADC performance by proper PCB layout (recommendations may be used in a future version of the design). Seven Steps to Successful Analog-to-Digital Signal Conversion (Noise calculation for proper signal conditioning) - Understand how to balance gain blocks and noise, 2010, R. Moghimi, Analog Devices. DC-coupled, single-to-differential design solutions using fully differential amplifiers, Michael Steffes, Sr. Applications Manager, Intersil Corp.
Calibrating amplifiers and ADCs in SoCs, M. Ganesh Raaja & Pushek Madaan, Cypress Semiconductor Corp., 2012. Referred to from EEtimes. The FmcAdc100M14b4cha implements double point calibration in the production test, using an external calibration voltage. It should be possible to implement Correlated Double Sampling (CDS) to dynamically compensate for offset errors. No internal calibration voltage is present.